When the days get shorter, the best way to keep warm on a winter holiday is to be with your loved ones in cosy lounges, or you can warm yourself by sliding on your ski boots or go for a walk leaving the slopes behind. Swimming and relaxing in thermal spas is becoming more and more popular every year. Start your long-earned winter adventure and discover new wonders with JUFA Hotels! Whether skiing in well-known and reasonably priced ski resorts with award-winning cross-country ski trails or winter sports off the slopes, you will find the right offer for you at JUFA Hotels. Our locations are selected in the most beautiful winter landscapes. From the Montafon, Kitzsteinhorn, Schladming-Dachstein and many more. The JUFA winter dream keeps you awake! Metres-thick natural snow on the 2,900-meter-high Hausberg mountain of Kaprun. The Kitzsteinhorn in the Province of Salzburg invites visitors with its 20 cable cars and lifts to practise winter sports in the airy heights, free-riding on deep-snow slopes, extensive slopes and sippping warm jägertee (hunter´s tea) in one of the numerous huts or restaurants. From the JUFA Hotel Kaprun, it´s a short trip to the Schmitten ski area, with panoramic views over an incredible range of 30 three thousand metre-high mountains and 77 kilometres of slopes. From Schladming-Dachstein, across the Planai and up to the Amadé Sports World: Winter holidaymakers at the JUFA Hotel Schladming*** enjoy many options. With its almost 3,000 metres, the Dachstein is the highest mountain in Styria and the region is an absolute paradise for skiers. A playground with 230 kilometres of sloes for skiers, mountaineers, cross-country skiers, snowboarders and free-riders. Hungry winter sports athletes are provided with various delicacies from the 85 ski huts situated around the slopes of the Schladminger 4-Berge-Skischaukel, which were tested during the World Cup and World Championship. Hike in snow shoes under the full moon or surrender to the fascination of Husky on trekking tours. Speed on well-maintained slopes or jet down into the valley on skis. Enjoy the fresh air at an altitude of 1.600 metres or more, with a clear mind! The mountain village Malbun is the highest village in the principality. Due to the wide range of winter sports activities, the JUFA Hotel Malbun – Alpin-Resort***s hosts winter tourists with a wide range of preferences. Three modern chair lifts and a drag lift make skiing a pleasure on 23 kilometres of ski slopes. 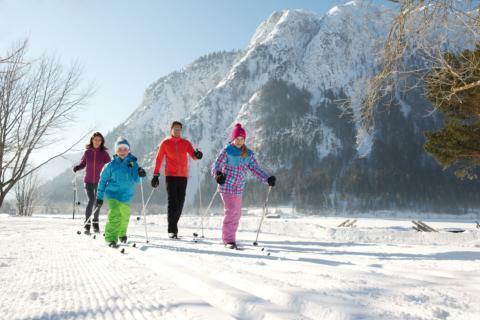 For those who prefer a more moderate pace: The Valüna Valley is a cross country skiing paradise and alternative winter sports types are particularly popular in Liechtenstein. Enjoy skiing at an altitude of up to 2.300 metres in Vorarlberg! Winter sports enthusiasts and recreation seekers will love it: 60 mountain railways and ski lifts, 268 km of marked and well-maintained slopes, 100 km of cross-country ski trails and about 290 km of winter hiking trails expect you at the Silvretta Montafon and Golm winter sports resorts. In the Vorarlberg Montafon Valley, between the Biel cave and Bludenz, of the Verwall group, the Rätikon and the Silvretta, Austria´s most demanding ski slopes, are literally at your feet. The JUFA Hotel Montafon*** accommodates its guests in Bartholomäberg, at the feet of the majestic Golm mountain world. In Tyrol, skiers slalom down into the valley until the last bit of snow has melted in late spring. During winter holidays, the JUFA Hotel Wipptal is the perfect starting point for action on the Bergeralm or the Stubai Glacier. With 28 km of slopes and having been awarded Tyrol’s slope seal of approval and at an altitude of 1,000 to 2,200 metres, the Bergeralm is very popular for winter sports. Additionally, nighttime skiing occurs several times a week, as well as cross-country skiing the entire Gschnitztal and the famous Wipptal panorama. The Stubai Glacier impresses visitors with its 62 kilometres of slopes, 26 cablecars and lifts. All cross-country skiing regions at a glance! Whether you partake in classic cross-country skiing or prefer the trendy skating style, everyone can discover a suitable track! This fantastic winter sport enables you to discover breathtaking mountain scenery whilst you work on your endurance levels and techniques. Im interested in the offer "Ski and Winter" in the .